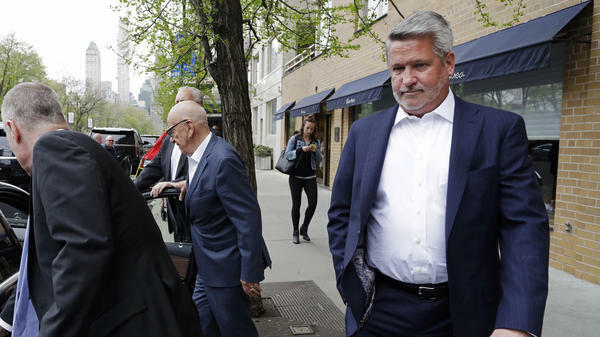 Bill Shine resigned as co-president of Fox News in May 2017 in the aftermath of sexual harassment scandals at Fox that led to high-profile departures. Fox News announced Shine's resignation from the network in May 2017 in the aftermath of sexual harassment scandals at Fox that led to the departure of Chairman Roger Ailes and host Bill O'Reilly. As NPR's David Folkenflik has reported, Shine was never accused of harassment, but women at the network alleged that Shine was aware of inappropriate behavior at Fox News and failed to properly address it. Shine denied those allegations. The White House has been without a communications director since longtime Trump aide Hope Hicks left in March. Hicks stepped in last August after a series of shake-ups within the White House press and communications staffs. She had replaced Anthony Scaramucci, whose short-lived but memorable stint as White House communications director came to an end after he gave an expletive-filled interview to The New Yorker. Shine will join a communications team that has, like the rest of the Trump administration, seen substantial turnover. Press secretary Sean Spicer resigned in July 2017, just six months into the Trump administration. Current press secretary Sarah Sanders has come under increasing scrutiny in the wake of President Trump's zero-tolerance policy for illegal crossings on the southern U.S. border. She reportedly requested temporary Secret Service protection after she was asked to leave a restaurant in Virginia and said her family had received threats. Media correspondent David Folkenflik contributed to this report. In addition, Shine is known to be close to Fox News personality and Trump booster and friend Sean Hannity.